Point Reyes National Seashore has a long history as a working landscape, with dairy and beef ranching, fishing, and oyster farming; yet, since 1962 it has also been managed as a National Seashore. 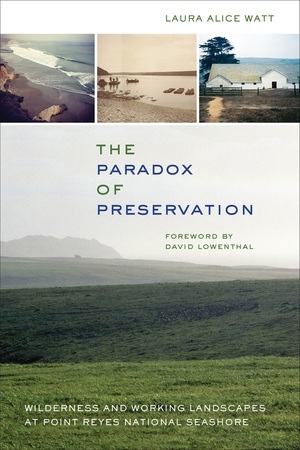 The Paradox of Preservation chronicles how national ideals about what a park “ought to be” have developed over time and what happens when these ideals are implemented by the National Park Service (NPS) in its efforts to preserve places that are also lived-in landscapes. Using the conflict surrounding the closure of the Drakes Bay Oyster Company, Laura Alice Watt examines how NPS management policies and processes for land use and protection do not always reflect the needs and values of local residents. Instead, the resulting landscapes produced by the NPS represent a series of compromises between use and protection—and between the area’s historic pastoral character and a newer vision of wilderness. A fascinating and deeply researched book, The Paradox of Preservation will appeal to those studying environmental history, conservation, public lands, and cultural landscape management, and to those looking to learn more about the history of this dynamic California coastal region. Laura Alice Watt is Professor of Environmental History and Policy at Sonoma State University.